One of the last things I need to do is rework my spreaders. The bolt that held them to the mast broke and I was a bit shocked and how wimpy it looked. There is nothing inside the mast to prevent any compression. It is simply a threaded rode that goes through the mast and holds both spreaders on. I am not sure how much load these take, Should I be concerned with mast compression at the spreaders? Me an my c-20 once had a fight with a bower line. 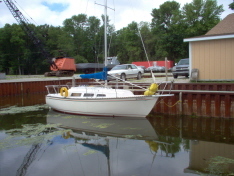 The c-20 lost' the mast brok at the spreder bolt, even with all that forse it did not compres the mast. perty clean brake, I only lost an inch of mast. Last edited by SN691 on Wed Mar 05, 2008 7:35 am, edited 1 time in total. not sure mine has a sleeve. If it did it does not now. Maybe I will have to take a look around inside the mast. There is a fair amount of distourtion from where the spreaders used to be mounted more then likely from the previous owned using the spreaders to move the mast while stepping it. It should be, like, tubular, dude! Short version: You need to have the compression tube, and may also want to fashion a reinforcement plate on both sides to deal with the deformed mast. While you're at it, the starboard chainplate mount needs to be reinforced, because from the factory it's secured at the aft end by a couple of wood screws and with proper rig tension will cause your deck to hog. In the past 4 months I've done a fair amount of work on Windward's rigging. Initial problem was a crack discovered in the masthead where the headstay attaches. From the factory it was only toggled fore and aft; this is marginal with a hank-on jib, but really not great with a furler. Having fixed that twice (properly, the second time ) I moved on. We can get into the masthead mods another time, but suffice it to say that on the 77-78 models it's wildly underbuilt and needs bidirectional toggling added, probably a stronger center plate, and could stand a larger pin. The spreader brackets were somewhat deformed. They concealed oblong holes, wallowed out by a bolt being slowly yet inexorably pulled toward the deck by the lower shrouds. Upon inspection the bolt turned out to be bowed a bit. The mast itself had some concavity around the hole, caused by the spreaders levering fore and aft under load. 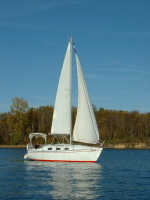 Because the mast was compromised and I sail Windward hard in big air, I wasn't in the mood to lose the stick. I went to www.onlinemetals.com and got some stainless tubing with 3/8" ID and, I think maybe 1/2 or 5/8" OD (I could check, but just stay with me for now). I overdrilled the holes to just bit, providing a darned tight force fit with the tubing. I then marked the tubing and cut it flush with the sides of the mast. I also got some 304 stainless plate, which I fashioned (with the help of a local machine shop) into external reinforcing plates, bending them to match the curve of the mast and then attaching them with #10 screws that I threaded into the mast. These were drilled for the 3/8" through-bolt and fit tightly on top of the 304 stainless tubing, sandwiching it into place. Tef-Gel wasn't available, so I lathered the surface up with 3M 4200 to guard against corrosion, and used blue Loctite on the screws. For good measure I ordered replacement spreader brackets from Dwyer Mast, plus a new stainless 3/8 bolt. I also replace the aft lowers, which were a bit kinked, with new 3/16. The rejuvenated rig holds its tune much better now, and accepts tension without complaint. Your mileage may vary. Void where prohibited. Some limitations apply. A prudent skipper never relies upon a single means of navigation. question: at the end of the spreader where the cable goes, is it normal the cable is loose? I mean the spreader could goes up or down and the only thing that prevent this movement is the spreader base and the friction with the cable. I completely agree with Windward that the chainplates are a bit weak on the C-26. As far as the spreaders I understand your spreader concept. Makes sense and sounds like it would add alot of strength to that area. My question is once the spreaders are bolted back on are they secure to the mast or do they tend to have some play in them. I think with only a single bolt holding them on there would be some play. I guess in the grand scheme of things once it is rigged the play takes care of itself. There's a retaining wire hole just inboard of the shroud slot. Idea is to wire 'em in. I used some aluminum flashing and made flat straps that hold the shroud in the slot. Once the rig's up and tensioned they don't want to slip out, and doesn't take much strength to keep 'em in place when the stick's down. Need to resize and post 'em. Just lots else going on now. 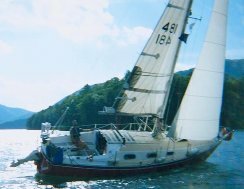 pics when you can would be great...and wow..do you use your boat...I see it is all OEM and you only make "no-nonsense" improvments and spend your time actually sailing....! in the top left pic you can see where it attaches to the bulkhead, in the bottom right pic you can see where it attaches to the back of the banquette. You get some force from the shrouds coming to the top of that long stretch of aluminum, and those 2 anchor points are not up to the task ! Keyskipper it sounds like your chain plates have already been reinforced. When you get a chance take a few pics and send them to me. I will post them on here for you. 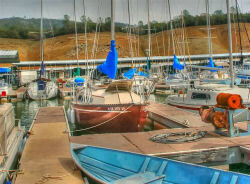 Windward wrote: Need to resize and post 'em. Just lots else going on now. Interesting thread. I'll need to do some checking on my C-26 to see if there is anything concerning. Also any update to this link? It just seems to go to some generic ATT page. I just tried using this and it keeps saying the image resolution is too large when I drag and drop a pic into the designated area.